Shoring Systems are temporary structural elements which serve to transfer loads during the various stages of construction. 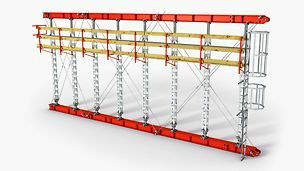 They support, for example, formwork until the concrete has reached its load-bearing capacity, or transfer loads from components and equipment during the construction, maintenance or demolition of structural works. 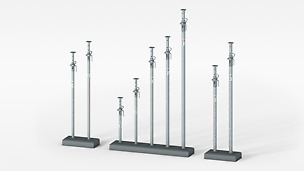 The requirements placed on shoring systems are diverse; load-carrying capacity, assembly height and adaptability are likewise important criteria as individual component weights as well as the possibility of integrating working areas and access means. 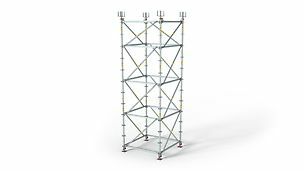 Props made of steel or aluminium are used which are often connected by means of frames to form shoring towers or slab tables. 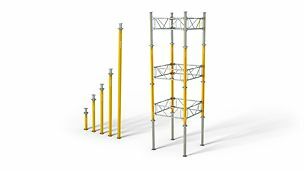 Shoring towers can also be realized using individual frames which are easily put together. 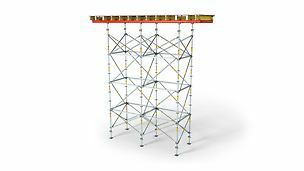 Enormous flexibility is offered through the use of modular scaffolding, ranging from a simple shoring tower through to complex spatial shoring, and can be adapted to suit virtually any geometry as well as different loads.